​If you search around on Google for "benefits of infographics" you will be bombarded with lots of different ways that you can use them to grow your online business. But one recurring benefit that every article lists is an Increase in Traffic. According to Search Engine Journal the main reason for this is that "Infographics are Extremely Shareable" because they combine the power of both text information and the viral power of images. That's why you often see them in Facebook and on Pinterest, people just love sharing good valuable information with their friends, and the fact they can do that with an image is an extra Bonus. They draw in huge amounts of social traffic. Because Infographics look pretty cool on the eye they are going to drive more people to your site because they are more likely to "share" it and "click" it. They are also well known for being a fun way to engage your audience and because they are graphical in nature are easy for your visitors to scan and understand whatever content you are sharing with them. But the main problem with Infographics up until now has been the fact that they are very expensive to get created. From my own research I have found it can cost several hundred dollars for a basic design, and for most of us that is a little out of our reach. Number of Pro Quality Designs with just a few clicks of your mouse. 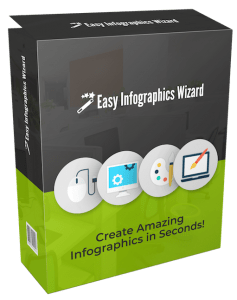 It comes fully packed with 500+ Graphical Elements that you can use to create your Infographics and a number of different Backgrounds, Borders and Text Layers to use. But not only that, we have also have 10 Professionally Designed Infographic Templates included in the software so you never have to create your own from scratch if you don't want to. I want to share with you an incredible piece of software called Easy Infographics Wizard. And as the name suggests it allows you to create awesome looking Infographics with just a few clicks! Statistics from social network Digg reveal that since 2007, Infographics on Digg have increased by 250 times! But why is this software worth checking out and what can it do for you? Well simply put, Infographics are some of the most shared content online and are the easiest way to send your content viral. The reason for this is that they combine the benefits of both Images and Information in one and people just love sharing cool infographics around the web, especially on Facebook and Pinterest. You can check out some case studies done by Brian Dean and the benefits of Infographics for backlinks and how it increased his organic traffic by 175%... and how Brian got page one rankings just from using infographics in fact he is number 2 behind Moz for the keyword “On Page SEO” just from using infographics to get links. Simply point, click, edit and publish your graphics. Forget about pixels, formatting and all the technical jargon. We took care of that. After checking it out I can say it’s very Drag & Drop simple and comes with Hundreds of Built-in Graphical Elements and lots of cool features. Not only that but it's also jammed full of lots of Professionally Made Infographic Designs that you can edit in seconds and use as your own. You also get Full Developer Rights to all your designs so you can start profiting from selling your design services on Freelancer sites or to Offline Clients who want to use Infographics in their business. This is available only on a 72 Hour Weekend Special and it Opened yesterday so you can save big when you check It out today. to share on your sites and get all the SEO & Traffic benefits that come from using Infographics. If you buy the upsell we will send you 1000 mixed links (video sharing site links and bookmarks) to Any URL of your choice. Here's what I suggest...Upload your infographic to your Pinterest Account with a link to your money url, and send us the pinterest post link. Use "infowiz70" at Checkout to Save 70% Off! THE REASON FOR THIS IS, SO THAT I CAN WIN AFFILIATE COMPETITIONS. THEREFORE, I GIVE HIGH VALUE BONUSES. BUT THESE BONUSES WILL NOT BE AVAILABLE AFTER A LAUNCH HAS FINISHED OR WHEN THE COUNTDOWN TIMER ENDS.